This Expert Advisor works with dynamic entry channels and a sophisticated hedging algorithm based on MA + ATR * coefficient, Bollinger Bands, Envelopes and PSAR. It is based on the loss recovery zone method modified by multiple dynamic settings. Breakouts outside the channels will be recognized and serve as entry or hedge signals. When the EA hedges it uses the multiplier for the calculation of the lot size of the positions. A hedge cycle continues until the basket is closed with take profit. Then the EA waits for a new entry signal. The user can choose his entry method and the settings are fully customizable to the requirements of the trader. Multiple take profit scenarios can be defined. An emergency hedge with a user defined distance. Order number can be limited due to number of open symbols or open trades. Close buttons in the chart. Magic number - keep it 0 when trading with TH Box only, if other EA with same pair on same client, then change. Start lots - fixed initial lot. DepoPer001Lot - enter account deposit for 0.01 lot (automatic calculation for every initial trade). Risk % lot - current balance * 0.01 / 100 / 100 (example: 5000 * 0.01 / 100 / 100 = 0.005 → 0.01, rounds the lot to 2 decimal places). Lot multiplier - multiplier for every hedge. Max. lot - opens hedges to this maximum lot (after that no increase). Take profit, points - take profit in points. Take profit, currency - take profit in currency. Stop loss, points - stop loss in points. Stop loss, currency - stop loss in currency. Lvl1, number hedge orders - change hedge strategy after this order. Take profit lvl 1, points - new take profit in points after lvl1. Take profit lvl 1, currency - new take profit in currency after lvl1. Lvl2, number hedge orders - change hedge strategy after this order. Take profit lvl 2, points - new take profit in points after lvl2. Take profit lvl 2, currency - new take profit in currency after lvl2. 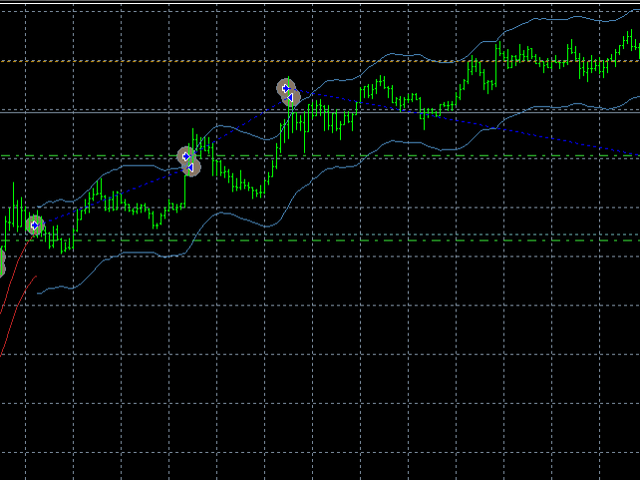 Lvl3, number hedge orders - change hedge strategy after this order. Take profit lvl3, points - new take profit in points after lvl3. Take profit lvl3, currency - new take profit in currency after lvl3. Emergency hedge, points - hard defined line for hedging in opposite direction (valuable for sudden breakouts in other direction). Trailing start, points - Trailing start in points. Trailing distance, points - Trailing distance in points. New filter - news filter on/off. No trade before, min - no new initial trade before news in minutes. No trade after, min - no new initial trade after news in minutes. Close all before, min - Close hedge cycle before news in minutes. Close all after, min - Close hedge cycle after news in minutes. Close buttons in chart - close buy, close sell, close all (for manual intervention). Next hedge manual - place next hedge manually instantly. 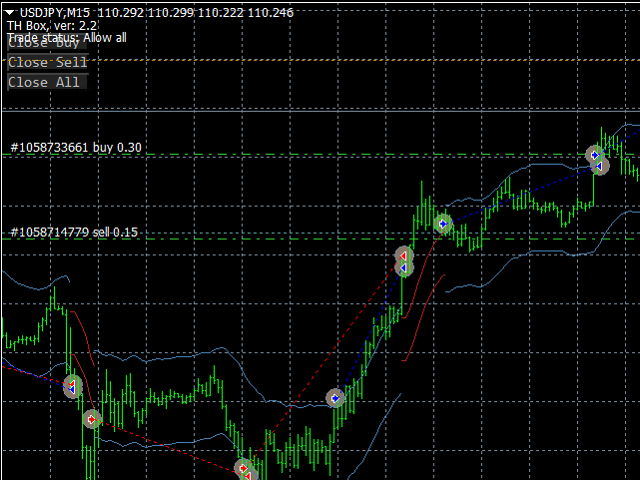 Indicator in chart - makes you defined indicators and lines visible in your charts. Color entry signal (channel) - color defined by user. Color hedging cycle (channel) - color defined by user. Use indicator - MA + ATR coeff, Bollinger Bands, Envelopes, (PSAR: always uses first point of PSAR). SAR step - SAR step defined by user. SAR maximum - SAR maximum defined by user. ATR period - ATR period defined by user. MA period - MA period defined by user. MA method - Simple, exponential, smoothed, linear weighted. Multi factor first order - Multiplier for distance of ATR lines from MA. Multi factor next orders - Multiplier for distance of ATR lines from MA for following hedge orders. BB period - Bollinger bands period defined by user. Deviation first order - BB standard deviation of upper and lower band for first order defined by user. 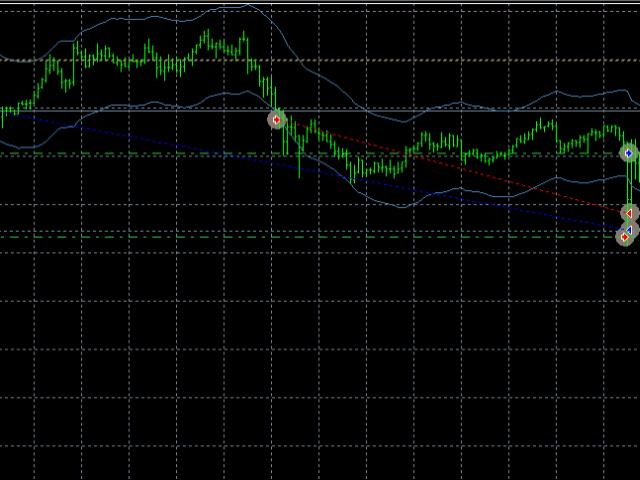 Deviation next orders - BB standard deviation of upper and lower band for following hedge orders defined by user. Envelopes period - Envelopes period for calculation defined by user. MA method - MA method for envelopes defined by user. Deviation first order - standard deviation of envelopes for first order. Deviation next orders - standard deviation of envelopes for following hedge orders. Stop by max order one symbol - If number is exceeded no more initial trades are allowed on all pair. Stop by max symbol trades - If number of open symbol is reached no more initial trades from other pairs are allowed. First week testing in demo account. Great results same as in back test. Good profit and performance of EA, highly configurable. Testing 5 pairs now. Next step will go into real account. change: line "Ask<channel_down" replaced by "Bid<channel_down"